The fact that Amour is an instant classic in the art-house world is as indisputable as the emotions presented by the protagonists of the film are bewildering. This picture is Haneke's minimalistic yet mightily expressive homage to love as we know it, showing the feeling's overpowering force and heartfelt, altruistic nature. While remaining a thoroughly unsentimental and provocative picture, Amour delivers a most-demanding portrayal of an elderly couple's last days together. Those cultivated, sophisticated characters need to evaluate their long-lasting marriage and come to terms with their own emotions, and, simultaneously, discover the true meaning of love in itself. Decisions need to be made, and some of them might be shocking to say the least. It's a beautiful but considerable piece of filmmaking, where a sombre atmosphere and touching yet disturbing imagery permeate every scene. Haneke's steady and visionary directorial hand promises many moving and heartbreaking sequences, while still providing a poetic exemplification of a well- lived life's concluding moments. It's impossible to find neither a plausible sense of redemption nor an authentic touch of consolation, no. The film displays a marvelous character-driven narrative, where loving individuals diverge from the seemingly familiar path and start arguing with their own opinions and ideals, leading to some truly perplexing choices. In the most unexpected manner Amour touches the controversial topic of euthanasia, emphatically depicting how difficult it might seem to even consider such a harsh decision. 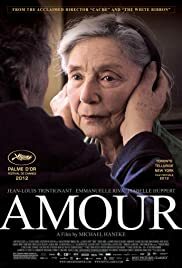 Amour is a tender, scrupulous, demanding, two-hour visualization of a romance well beyond boundaries, and through its difficult notions it shows human existence in its most intimate and most elegiac state. 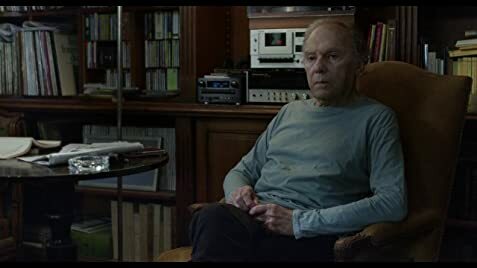 That death seems inevitable from the very first minutes is certain, but the way Haneke chooses in order to finally arrive at this intensely upsetting conclusion is an uneasy one. Amour is definitely a cinematic powerhouse, which will leave the audiences in a most pensive, quiet - even downcast - mood, still astounding with its ubiquitous beauty. 93 of 125 people found this review helpful. Was this review helpful to you?